May the Schwartz Be With You: The Schwartz's vs HIVES! 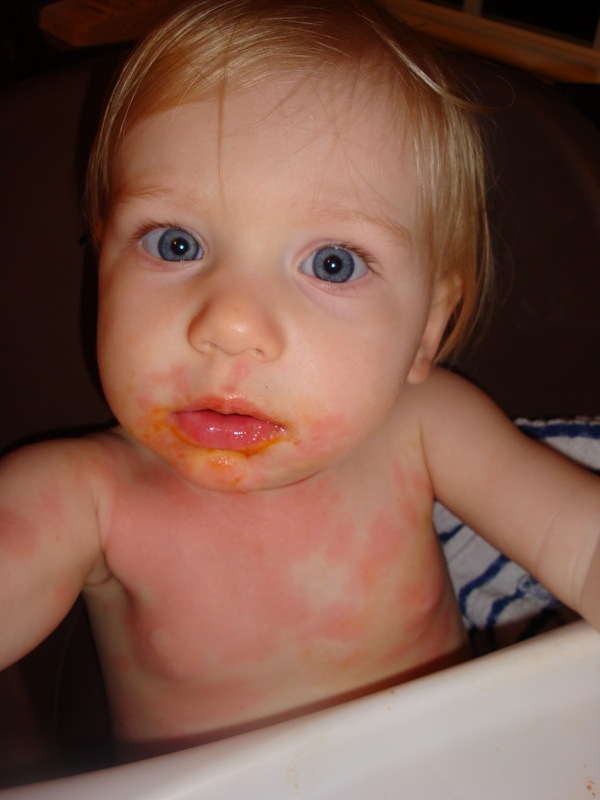 So, Sarah had a mystery allergy until yesterday when we discovered what it was. 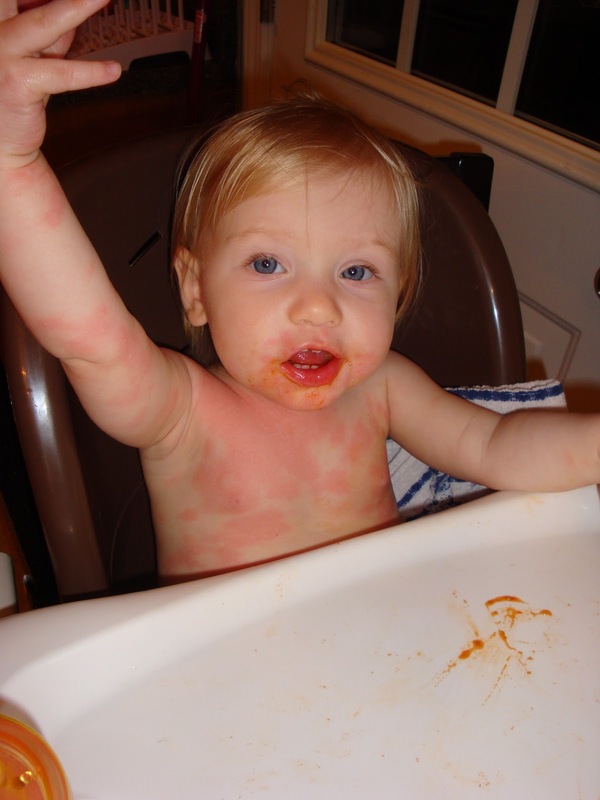 The past few times we've had dinner with the Joiner's, Adam and I have noticed Sarah breaking out in hives. The first time it was just red welts on her face. This last time there were a lot more and they were also on her arms. He and I both thought it had to be the adorable hypoallergenic dog, Chloe Grace. Chris and Laura were trying to figure out if I had switched laundry detergent, or if it was the clorox wipes used to clean the high chair. But we use the same type of cleaning products at home so it couldn't be that. Of course it didn't make sense that Sarah was breaking out only at dinner. She was fine when we come over to play and food isn't involved. What was for dinner? Well, some of Sarah's favorites grilled cheese, or mac and cheese, and of course some veggies for a well rounded meal. Elsie Tate's favorite veggie is peas. Sarah seemed to love them too. She's had them before, but since Chris and I don't LOVE peas we don't buy cans of them, Sarah gets them when they are in other veggie medley mixes but she has had them before. And she does love them when we are at the Joiners. So tonight, we opened up a can of peas for the first time and gave Sarah some to eat while Chris and I ate. It's so rare because of his school and work schedule that we actually get to eat dinner together, so we try to either feed Sarah finger foods, or at least give her some to start so she's happy while we eat together and then one of us cleans up the kitchen while the other feeds Sarah. Anyway, she's going to town on those peas. She is gobbling them down like they are the best things EVER. Then it starts. A few red welts appear. I'm not freaking out, in fact I was excited to finally know what was causing them, I even called the Joiners to share the good news. She's had peas before so even if she is allergic she's not going to die. But they start spreading and spreading till finally she looks like this and Chris is asking if maybe we should give her some benedryl. To which I looked up and saw how bad it good and immediately grabbed the benedryl. So I guess Sarah has her first official food allergy: peas. We didn't discover it when she was on baby food because she hated them and would spit them out, I guess that should have been a clue. If she has a legume allergy, be real careful with peanuts and peanut butter. There is a connection between peas and peanut allergies. Don't freak out, just be careful when you introduce peanut butter. She's also still young and her body is getting used to all this new stuff. Strawberries used to make kid #4 break out horrible, now she eats them all the time no problems. Good thing you learned what she was allergic to so you can prevent it in the future. Oh and btw we updated the coding for disabling right click on your blog, so you can go back now and check it out:) Have a great day!